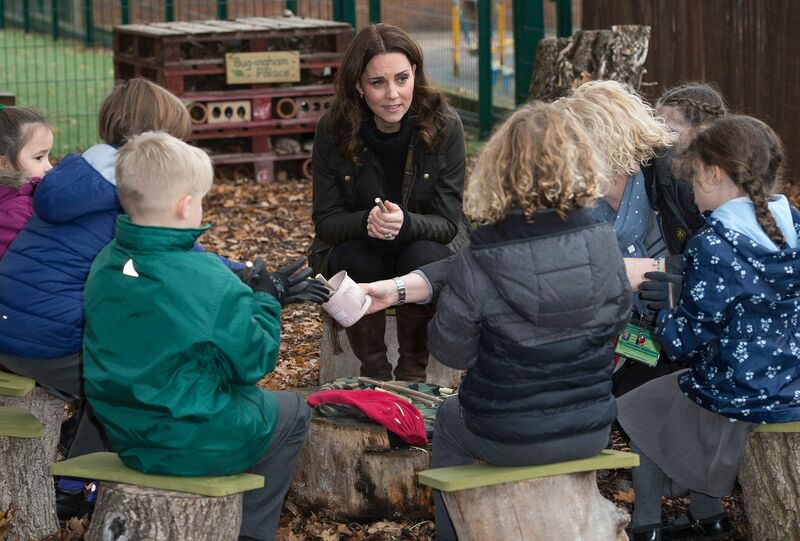 When the Duchess visited a primary school in south-west London last November to see its gardening projects, she told pupils she had "fond memories" of being outdoors as a child, and was passing that passion on to her own children. While Kate made her debut following her third maternity leave with an adorable visit to the Sayers Croft Forest School and Wildlife Garden, she revealed one activity that her two eldest children just love - and it may come as a surprise! The Duchess looked effortlessly chic as she dressed casually for the outdoor event in a warm jumper, Zara biker jeans, a khaki hoodie jacket and her favourite knee-high boots - which she's kept on rotation for 14 years. Her solo appearance is her first engagement since she gave birth to baby Prince Louis on April 23. The 36-year-old holds children's mental and physical wellbeing close to her heart, and Sayers Croft aligns perfectly with her values, encouraging inner-city kids to enjoy some time in nature. Throughout the summer, Kate Middleton has only made a handful of appearances in public, including Prince Harry and Meghan Markle's wedding back in May and of course, the Wimbledon tournament in July. She also attended Trooping the Colour in June alongside Queen Elizabeth.